Over-all I am quite satisfied with the tail tidy install process and the overall look. The install took less than a half hour. My suggestion would be to bring a laptop out to the garage to watch the install video as you work. Disadvantages: The only disadvantage to me is that the seat lock is now exposed to the elements. Hopefully TST engineers can remedy this on the next generation. I would highly recommend the Elite 1 fender eliminator kit for the MT-09/FZ-09. It does a great job at closing up the gap left behind from the stock fender, is easy to mount up (just watch the video). I opted for the adjustable and the LED pod taillights. Is the adjustable necessary? Probably not, could probably bend the less expensive version if you wanted to. I flipped the mounting brackets for the LED taillights so that they fit tighter to the license plate than they depict in the video and it looks great. Advantages: Easy to install, looks great. Nice tight look to the rear of the bike. Would buy again. Disadvantages: Including a way to keep the seat lock covered would be a good addition. I love my FZ-09, but the stock fender ruins the otherwise super aggressive look of the bike. The eliminator gives a great clean line to the tail and probably went on in about 20 minutes total. Disadvantages: As others have said, the seat lock is uncovered. Not a huge problem in SoCal, but I could see corrosion being an issue for some riders. The components of this fender eliminator really took me by surprise! The black anodized billet aluminum close out as well as the mounting pieces look and feel like top quality parts. This kit gets rid of the giant bulky rear fender and really cleans up the look of your bike. I'd give this product more stars if I could! Recommendation: Step up and spend the few extra bucks for the adjustable kit. Having the freedom to put the license plate at whichever angle you want is a real treat! Disadvantages: Kit does not provide a cover for the seat lock cylinder, but certainly not a deal breaker! 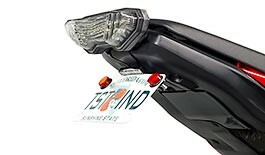 Have used TST Fender Eliminator Kits on my previous bikes so it was a no-brainer to purchase this one for my FZ 09. Kit goes on fast and easy and the parts are all quality.